Though prizes are rarely awarded for students who pull all-nighters, an exception was made over the weekend of February 8th. 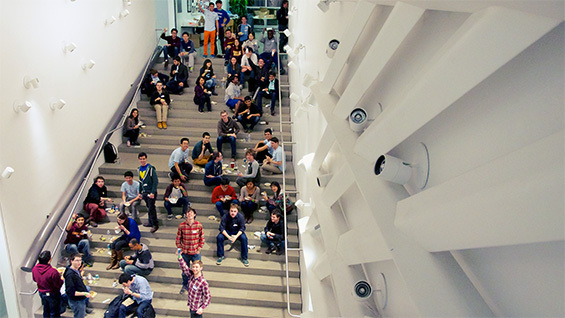 The Cooper Union hosted its first-ever hackathon, an intercollegiate, interdisciplinary event that opened up the labs at the Albert Nerken School of Engineering to the creative whims of 100 students for 24 hours. Organized by create@cooper, "hackCooper" awarded prizes to the three best "hacks," collaborative projects that solved a problem or were just interesting but that were developed and built entirely during a 24-hour period. The top prize went to a device shaped like a turtle. "HackCooper went really well," Sharang Phadke, an electrical engineering senior and co-founder of create@cooper, says. "In the end there were 27 projects that were really high quality. The sponsors were all impressed by the hacks and by the students." 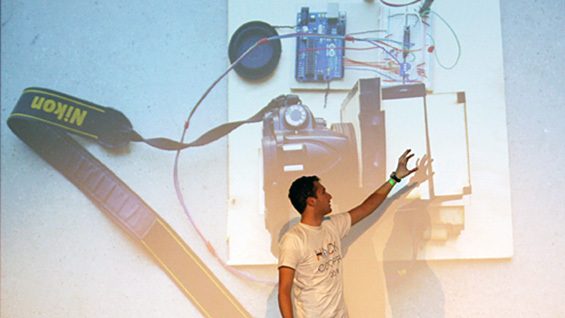 Though the term "hack" is commonly associated with computer subterfuge, hackathons focus on intensive, short-term collaborative creation often among students, but increasingly professional organizations have sponsored them as well. This was the first for The Cooper Union, which gave the event its own flavor. "What's particularly cool about hackCooper was that the top prizes were awarded to hardware hacks," Andrew Rehayem, the event coordinator for create@cooper and an electrical engineering sophomore, says. "The vast majority of hackathons, like the ones at Columbia, NYU or Duke, all focus on software. It's a funny dynamic at Cooper. Because we are so small, everybody has access to the laser cutter, for example, whereas at a bigger university, if there is only one laser cutter, it has to be shared with thousands. Consequently Cooper students get pretty good at prototyping stuff and making things pretty quickly." 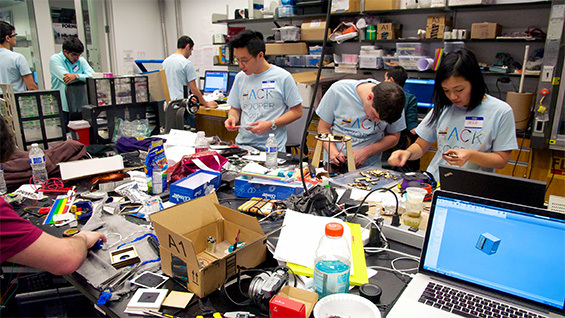 Starting at noon on Saturday, students from The Cooper Union schools and others in the area formed teams, brainstormed, built and coded projects without any advance work. Sponsors included Yahoo!, McGraw Hill Education, LinkedIn and others. Many sent "mentors" who, along with Cooper Union faculty, mingled with the students giving advice. Some presented short talks, such as one on cryptocurrency and another on taking your hack to the next level. Work went through the night, fueled by free food and free materials. But all work had to stop at noon the next day, whereupon each project team gave a two-minute demo to a panel of judges and the rest of the participants. Third prize went to "hippocampus," a web-based scrapbook for sharing images, music and more. Second prize went to "High Frequency Stealing," a game like Simon, pitting two players against each other to see who can be the first to press buttons in the same order as matching LEDs flash. To make it more interesting, each player logs into a virtual currency account and loses or gains real money depending on their skills. 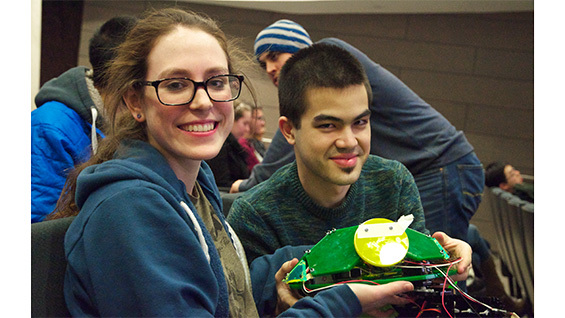 The top prize, with its $999 award, went to "TurtleBot," created by Alex Dworzanczyk, Hannah Talisse, David Tan and Henry Wang, a team of Cooper Union mechanical engineering students. About the size of a Roomba, the robotic home vacuum cleaner, and built with a similar purpose, TurtleBot is designed with two arms and a bright green shell that covers a spinning brush underneath. It is meant to climb the mesh of 41 Cooper Square and clean it, although this could not be tested. In spite of this, the judges were impressed. "At hackathons the idea isn't that what you make has to work 100% or be scalable or marketable," Sharang Phadke says. "The goal it to just 'hack' something together as quickly as possible. The Turtlebot crew CADed everything, cut out all the gear boxes and wrote all the code themselves in 24 hours. That was impressive." "People will always tell you to 'just go' to a hackathon--that you don't have to know how to program--and you never believe them," Andrew Rehayem says. "You expect that in order to make anything cool, you have to have lots of experience. But when you are there, you see people winging it, just working on whatever is off the top of their heads, and a lot of times actually coming up with something interesting. So you internalize that it isn't that hard to make something."